We support you with the implementation of your SAP-applications with our consulting services and target group specific trainings. This enables you to utilize your SAP-Systems in the best possible way. We advise you in the optimal use of SAP software. We analyse the present situation and provide a tailor-made concept which we implement together with you in a joint effort. From the training concept until the training delivery: we impart competence in working with SAP software to your employees in IT and all other involved departments. 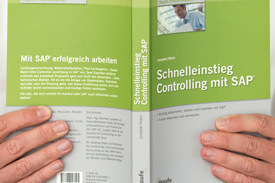 In our publications we explain the appli­cation of SAP-Solutions in management accounting. We focus on the real life application in industry and the practical relevance of the functionalities described.